Home Astrological Charts	Will Chavez run? If so, will he win? Will Chavez run? If so, will he win? A horary on the outcome of a presidential election. Hugo Chavez is the Venezuelan’s president. He has cancer and he does not know whether he will be in good enough health to run for the presidency. The querent is not Venezuelan or lives in Venezuela so Hugo Chavez is the “president of a foreign country” for him and is signified by the ruler of the turned 10th from the 9th house: Mars. The “presidency” is the Sun, ruler of the radical 10th house. 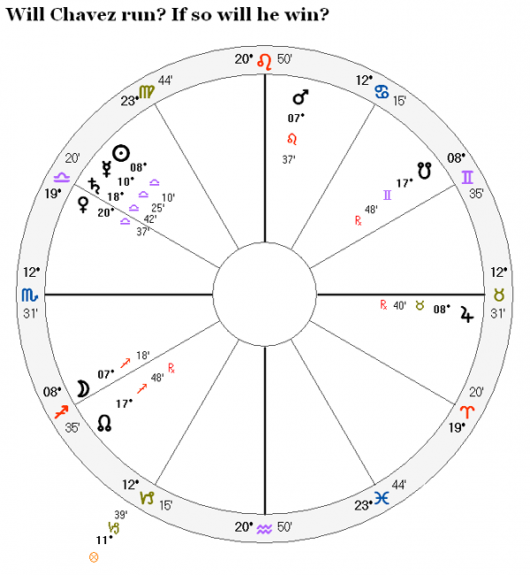 Mars in the 10th cusp’s sign showing Chavez is interested in the presidency. If his health was an obstacle we would see his Lord 6 or some other relevant planet obstructing him in some way. This is not the case. So he will run for president. The Moon (the natural ruler of the people) translates light from Mars to the Sun. Or simply, the Moon trine to Mars will do. Yes, he will not only run, he will win. Literally: the people or electorate (Moon) will take him to the presidency by vote. He ran and was re-elected by vote. Will Hugo Chavez recover from his illness? Why am I so sick?